Posted by Ada Wang on 11/19/2018 11:31:14 AM. People can read Amazon Kindle books on Kindle eReaders, Kindle Fire tablets as well as other smart devices with Kindle apps installed. Generally, once a device is registered to an Amazon account, all Kindle books under that account will be synced automatically with Internet connected. However, if we want to read non-Amazon books on Kindle or purchased Kindle books do not shown on the device due to a connection problem, we will have to transfer books from computer to Kindle manually. This guide will tell you how to transfer books to Kindle, Kindle Fire (HD), Kindle Paparwhite, Kindle for Android/iPad app from PC or Mac. Note: If you were a Kindle e-ink device owner (such as Kindle Paperwhite), here I strongly recommend you directly read this part. Step 1: Make sure your personal books are MOBI format. Amazon Kindle does not support EPUB books, but supports MOBI (DRM-free) and PDF formats. I personally prefer MOBI to PDF because the former is more flexible and better for reading. Books downloaded from torrent sites are often EPUB or PDF. If you want to transfer these books to Kindle for reading, you will have to convert them to Kindle supported MOBI or PDF. Follow this guide to convert EPUB books to MOBI with free Calibre. Remember to set the output format to MOBI. If you want to transfer eBooks purchased from Barnes & Noble, Kobo, Sony or other stores to Kindle, things will be a little tough. These books are typically DRM protected so we can't directly convert the formats. Instead, we have to strip the DRM restrictions first. DRM-protected PDF books also have to be decrypted because Kindle only supports DRM-free PDF. Once the books are open MOBI or PDF, we can easily transfer them from PC/Mac to Kindle, Paperwhite, Kindle Fire (HD), Kindle for Android / iPad app with USB or wirelessly. Connect your device to computer via USB. Double click the drive to open it and view the folders. Select the item you want to transfer (mobi or pdf). 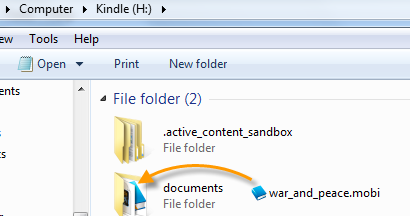 Copy books to the folder (documents) under Kindle drive. 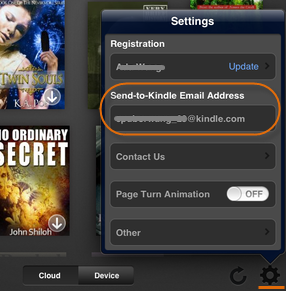 Or you can also use the Send-to-Kindle email address. For each case below, I mainly explain how to transfer MOBI eBooks to Kindle with USB, which also works on PDF docs. To transfer books to Kindle without a USB cable, you should first find out the device email address (mentioned in each case), then send your books to the given device/app address. Here I take the Kindle Paperwhite for example. 1 Connect the Kindle device to computer with the USB cable. It will be recognised as a "Kindle" drive. 2Drag and drop the MOBI books to the "documents" folder under Kindle drive. 3 Eject Kindle from computer. The loaded books will display under "Device" shelf. Tap the menu icon (top right corner) from the home screen, then "Settings" -> "Device Options" -> "Personalize your Kindle" -> "Send-to-Kindle E-mail". 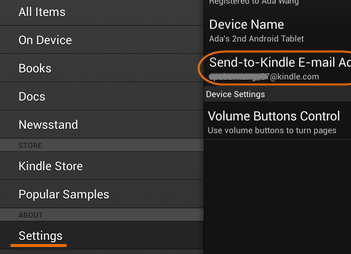 For conventional Kindle, select "Settings" from the home screen menu and use the Next page and Previous Page buttons to get the Send-to-Kindle E-mail. 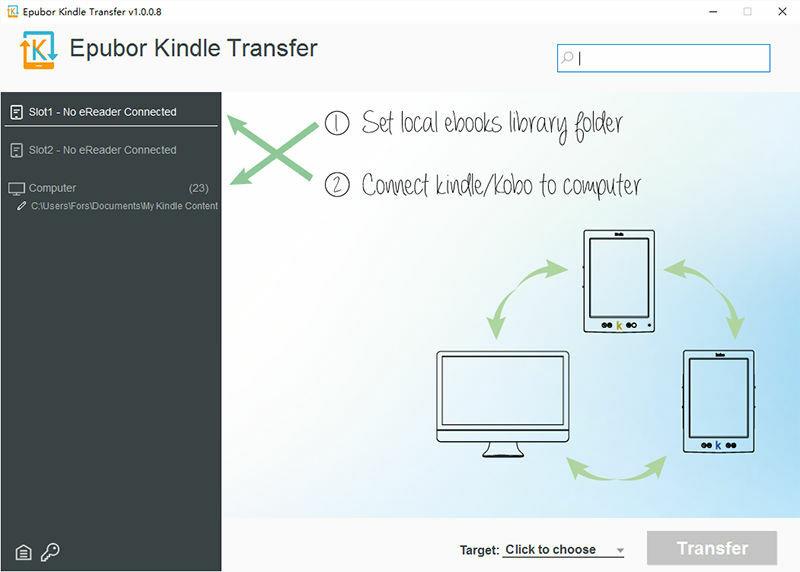 This tool helps us directly transfer books from Kindle / Kobo to Kindle e-ink, no matter your books are DRMed or not. Highly recommend this tool to those people who collected hundreds of eBooks files and had a Kindle or Kobo device. Note that Kindle Fire (HD) does not come with a USB cable. If you don't have a USB cable, get the Send-to-Kindle email address of the Kindle Fire and transfer MOBI or PDF books to it wirelessly. Here I take the Kindle Fire for example. 1 Connect your Kindle Fire (HD) to computer with the USB cable and it will be recognized as a Kindle drive. 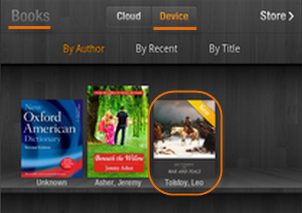 2 Copy and paste your MOBI books to the "Books" folder under the Kindle Fire (HD) Drive. 3 Check the transferred books by tapping "Books" (on the top menu bar) then "Device". Tap the top right corner, select "More..." -> "My Account" to get the device email address. Here I take the Nexus 7 for example. 1 Connect your Android tablet or smart phone to PC. 2 Go to the "Kindle" folder of your Android device storage. Copy and paste the MOBI books to that folder. 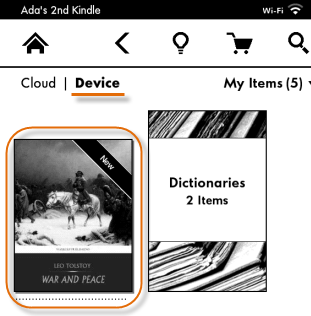 3 Tap the menu icon in the top right corner of Kindle app, then select "On Device" to check the transferred books. Tap the menu icon (top left corner), then "Setting" to get the "Send-to-Kindle E-mail Address". There is no way to directly transfer MOBI books to Kindle iPad / iPod / iPhone app with iTunes. 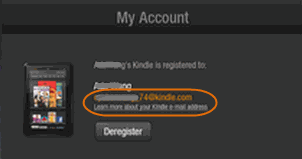 In this case, we can use Kindle email system to send personal MOBI books to the email address of Kindle for iPad app. PDF files can be transferred to iPad with iTunes (opened with iBooks by default) or with Kindle for iPad email address (opened with Kindle for iPad app by default). 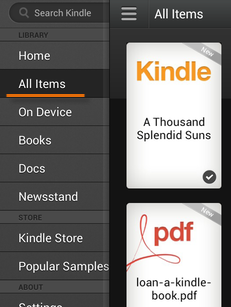 Tap the gear icon in the bottom right corner and select "Send-to-Kindle Email Address". As long as we know the email addresses of the Kindle devices or apps, we will be able to send DRM-free MOBI and PDF books to Kindle, Kindle Paperwhite, Kindle Fire (HD), Kindle for Android / iPad app wirelessly. 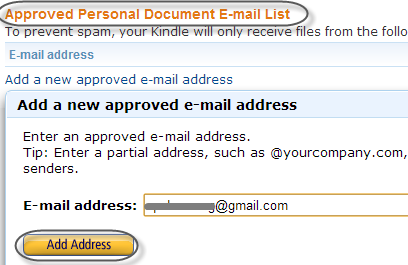 1 Add your own (sender) email address to Kindle Approved Personal Document E-mail List. Visit Manage Your Kindle to sign in, go to "Your Kindle Account" from the left side menu and select "Personal Document Settings". Pay attention to the "Approved Personal Document E-mail List" and select "Add a new approved e-mail address." Enter your e-mail address then click "Add Address." 2 Compose an empty email (empty subject and empty body), attach your MOBI or PDF docs and input the Send-to-Kindle E-mail address to send. When you transfer PDF books to Kindle from computer, you will find the books not shown under "Books" (on device) shelf or category. That's right. PDF books typically display under "Docs" (on device) shelf. If your purchased Kindle books are not auto synced due to an Internet issue, you can download the books to your computer (Amazon site -> "Manage Your Kindle" under "Your Account" -> "Actions..." -> "Deliver to my..." -> "Download and transfer via USB") to download the books to your computer. The downloaded books are typically AZW3. Transfer them to your Kindle device or app according to steps above. With this method to transfer your books you can also sync the furtheset page you last read, highlight, notes, etc.. For details please read this guide whispersync for Kindle. This guide is based on Windows OS, but it also works if you want to transfer books to Kindle from Mac. As long as the books are not protected and converted to Kindle supported formats (MOBI or PDF), we will be able to read eBooks from other sources without confining to Amazon. This guide is writen for Kindle or Kindle Fire users or lovers. We also gathered top 10 kindle fire cool tricks, see the full list below. Great post. Thanks very much. Thank you for the post, it was really helpful. Thanks so much for the wonderful advice and coloumn. I have so many gift cards for Indigo (Kobo) yet I own a Kindle paperwhite. This software has enabled me to use my gift cards to purchase books for free and then read them on my Kindle. The instructions are very clear. I've not had any glitches. Wonderful!!! Thank you so much! I spent 5 hours trying to transfer using the USB cable. Your send-by-email instructions worked perfectly. Thanks for this. It's a big help! Worked like a dream. I can't believe how easy this was to transfer from Kobo to my Kindle Paperwhite. Thank you for your comments. We are glad to know that this software can solve your problem. I have been working on this all morning and thanks to this post, I am finally able to transfer my books to my kindle paper white. Thank you! 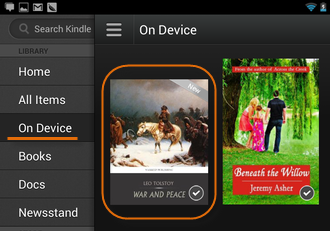 Just tap the file and tap share to kindle on android devices.. The method on here didn't work for me. This did not work for me, I tried both programs, Epupbor and Ultimate. I was able to convert my Kobo files to mobi, but then they would not transfer. There is not "on Device" tab on my Kindle Fire 7th Gen. Tried copying and pasting, transfering, etc. The books are NOT on my Kindle device. Thank you for using Epubor software. Epubor software can handle books downloaded via kindle/KOBO desktop application, kindle/Kobo ein ink device, not included Kindle fire which is a tablet.